JHAPA, Sept 10: Cooperatives and banks that have invested in e-rickshaws are now worried about losing their money, as there is high possibility that these rickshaws will be displaced due to their high operational costs. Unable to manage operational costs, e-rickshaw drivers are venturing into other businesses. They say the expense of changing the battery can come up to Rs 70,000. “The battery has to be changed every six months,” said Hari Baskota, an e-rickshaw driver. The drivers have opted for three wheelers tempo as e-rickshaws, though environmentally friendly, are hard to operate. Bumpy rides, slow pace, and depletion of battery charge on the middle of the way are some of the most pertinent problems the drivers face. E-rickshaws made entry in Birtamod three years ago overtaking pedal rickshaws. Youth from middle-income families had obtained loans from the banks and cooperative organizations to buy these rickshaws. There were 3,000 such rickshaws in Jhapa district. However, as the business started going downhill, the e-rickshaw dealers have shut down their businesses. 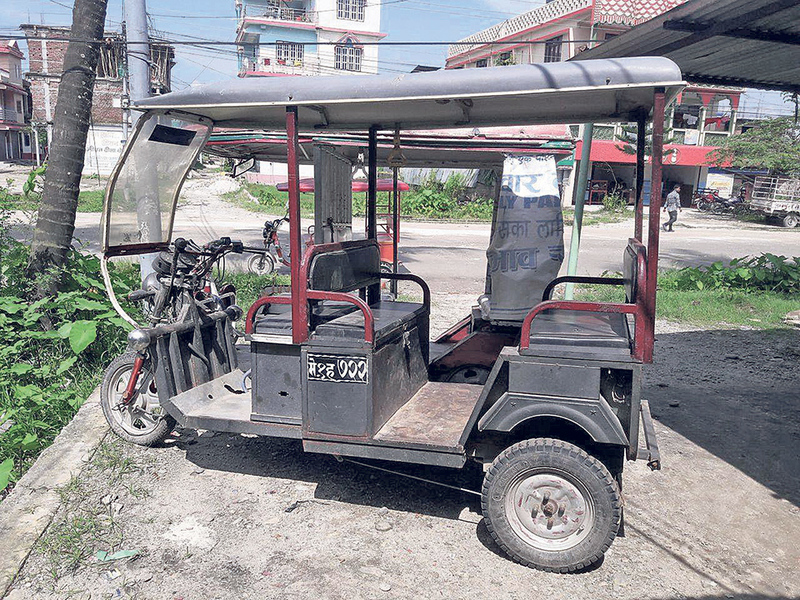 At the moment, there are only 650 e-rickshaws operating in Jhapa, whereas more than 2,200 three-wheeler tempos have been added. With the possibility of its displacement, banks and cooperatives that invested in the business are worried. A cooperative of Birtamod that had invested in at least 10 e-rickshaws is now facing a risk of loan default as the drivers have started venturing for other professions. Dhaulagiri Multipurp-ose Cooperative of Birtamod stated that it had invested in nine e-rickshaws. The drivers are now out of contact without paying more than Rs 400,000 which has left the cooperative worried about losing the money. Similarly, Public Cooperative of Birtamod had invested in 22 e-rickshaws, but it has not been able to get the money back, which now amounts to almost Rs 700,000. Likewise, banks too have not been able to get their money back. The cooperatives and banks had invested in the business, keeping the rickshaws as collateral. He added that some cooperatives were still investing in e-rickshaws but there was no guarantee that their investment will be retrieved. The e-rickshaws that cost Rs 260,000 are being sold for Rs 25,000 in junk shops. Pandey had opened the servicing center three years ago. He said that nobody came to him for servicing of the vehicle, instead they came to sell e-rickshaws at as low as Rs 15,000.